There are many career paths in child development. Some require degrees while others often require a specific certification. Five popular careers include preschool teacher, preschool and child care director, kindergarten teacher, teacher's assistant and nanny. 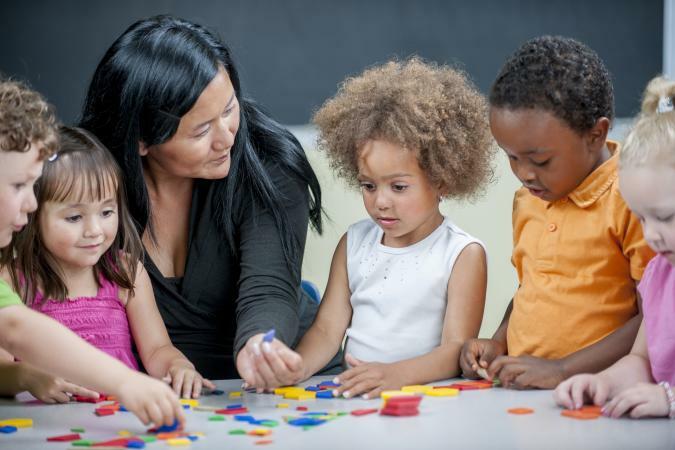 A preschool teacher and kindergarten teacher are two common child development careers. The teachers are responsible for the care and education of children. Preschool is the first introduction a child has to school. The preschool teacher prepares the child to enter kindergarten by developing language, motor skills, and social skills. The kindergarten teacher transitions the child from preschool to elementary school with reading and writing skills. Other teaching paths are also available to those pursuing child development careers. The education required for a preschool teacher position varies among states and institutions, however, an associate degree is the most common requirement. Some schools require a Preschool CDA (Child Development Associate) Credential that requires a high school diploma, GED or enrollment in a high school career and technical program in early childhood education. Nationally, kindergarten teachers are required to have a bachelor's degree. Public schools require a state teaching certificate, usually for kindergarten to fifth or sixth grade. Most have participated in an intern program before graduation. Many specialize in subjects, such as physical education or music. Experts in child development, Child Life Specialists (CLS) help children to cope with illnesses, hospitalization, and disabilities. This is accomplished through play, education, preparation, and various activities that provide children with ways to express their emotions and fears. Other duties include supporting parents and siblings and educating caregivers about the child's needs. Career options can include, children's hospitals, pediatric clinics, and pediatric hospices. Depending on the career path, a CLS needs a bachelor's or master's degree with a focus on human development and growth. Psychology and related fields are often accepted. Some hospitals and clinics require a CCLS (Certified Child Life Specialist) credential that's administered by the Child Life Council (CLC) that requires a supervised 480-hour clinical internship. A director for a preschool and child care is responsible for everything related to the operation of the business. This includes the day-to-day activities, administrative duties, budget, maintenance of the facility, teacher and staff supervision, and addressing parents' concerns and issues. A director administers all educational standards and policies. Independently owned/operated centers or schools, franchises, public schools and federally funded centers are all possible career opportunities. According to the Bureau of Labor Statistics (BLS), a bachelor's degree and no less than five years of experience in childhood education are required. However, there are some states also require Child Development Associate (CDA) Or Other Nationally Recognized Credential. A psychologist specializing in child development provides emotional, mental and social help for children and their families when dealing with life-altering events and various issues, such as anxiety, depression, or school problems. Career paths can lead to positions with hospitals, schools, social services, universities, private practice and mental health clinics. Licensed child development psychologists need a Ph.D. or Psy.D. degree. Special licensing and certification are required for clinical and counseling positions. There are 14 specialty certifications administered by the American Board of Professional Psychology (ABPP). The National Association of School Psychologists (NASP) is responsible for state licensing and the Nationally Certified School Psychologist credential. Most nannies do all the daily duties associated with child care and child-rearing. Many nanny positions require a live-in status, while others are only until the parent(s) are back home from work to take over. Some nanny positions require child development skills, such as socializing, manners, and teaching. Many full-time nanny positions, especially ones that may require a live-in status that also include traveling with the family, often require a bachelor's degree in childhood education or related coursework, and certification. A nanny position that doesn't require a college degree may state some certification requirements, such as CPR and first aid, water safety, infant care, nanny basic skills, professional nanny certification, or other certifications. The requirements may vary depending on the goals set out for the child by the parent(s). There are many job opportunities in child development. Explore the ways of interacting and teaching children to determine which is the best fit for your skills and experience.